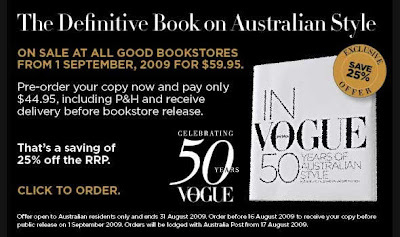 Speaking of Vogue, I was very excited to read about the fabulous book In Vogue: 50 Years of Australian Style on Australian style that is hitting bookstores on September 1. I just found a site where I could pre-order it and save $15 off the recommended retail price of $59.95. It's http://www.magsonline.com.au/ Can't wait to get it now.